In this post we will discuss some of the things that are a ‘MUST do’ before retaking the GRE. This post assumes that you’ve taken the GRE before at least once and that you plan to retake it because you felt that your score did not reflect your actual potential. If you’re going to take the GRE for the first time though, our blog post about how to strategise your GRE prep might be more suitable for you. ETS lets you analyse your test-day performance with the free GRE Diagnostic service. You will be able to access this service after about 15 days of your test date and this will remain active for 6 months after the date of your test. 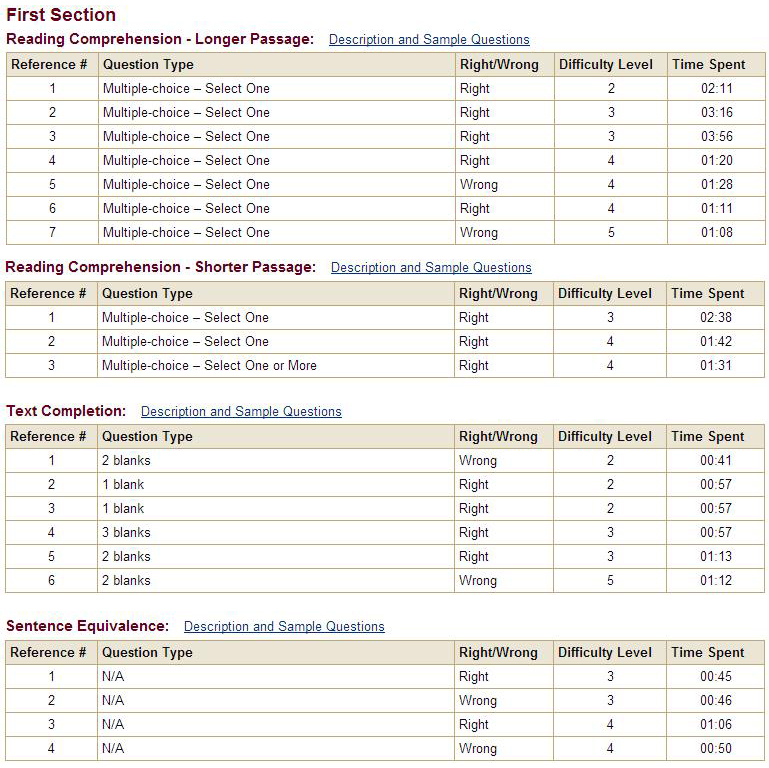 This service will let you finely evaluate your approach for each question within the Verbal and Quant sections, the difficulty levels of each question, the question formats tested and time taken for each question. This data is invaluable as it gives you critical perspectives on how you performed, what pulled your scored down and as a result, where your preparation needs to be focused to ensure highest score improvements when retaking the GRE. The picture above is a sample of a student’s actual Verbal diagnostic report. Perhaps your key weakness is vocabulary, or perhaps it has more to do with time management. Whichever it is, ensure that you identify it by analysing your diagnosis report. Taking a full-length mock test will also help you understand your core weakness better. If your core weakness is conceptual (perhaps coordinate geometry), get your conceptual knowledge fixed through online videos, prep books or a preparation program. If your core weakness is time-management, plan to solve a mixed set of 20 questions at one go, keeping time a constant. Your goal must be to respond to as many questions accurately as possible. This sometimes means letting go of a few questions that might eat up too much of your time. Depending on what your identified weakness is, plan a course of action to remedy it so that you do not make these mistakes when retaking the GRE. Most students are surprised when their GRE scores are much lower than the ones they were expecting or have been experiencing during their practice sets and mock tests. The reason this happens is most probably because their tests and practice sets were not ‘GRE Like’. Remember that the GRE is almost a 4 hour long testing experience. You have no option to pause the test. Fatigue sets in towards the end of the test and this makes maintaining composure an extremely hard task. A cumulative effect of these things is that comprehension levels and decision making abilities dwindle with every section you complete. If there is at all any secret behind why some people score 320’s and above, it’s that they are more comfortable with these four aspects of testing than the rest of the test takers. The only way you can develop these aspects of test taking, is if you make your practice sets similar to the GRE test day experience. When taking Full-length tests, take the entire test with AWAs. Take breaks in these only when the tests allows you to (and stick to the break timings). If possible take your mock tests during the time (eg: 10am) that you are likely to book your next actual GRE slot for. Though you may be able to analyse and identify core weaknesses and even evaluate effective plans of action, you may find yourself stuck at a particular score level – unable to jump beyond it. The only way you can surpass the “wall” you’ve hit is if you get strategic guidance from a mentor. This could be someone who has scored really high on the actual test, someone who has taught the GRE for a while or even a professor or a friend who is really good at analytical reasoning. Having a fresh pair of eyes look at your test taking approach can help you identify problem areas that would have otherwise slipped your notice and ensure that you score significantly better when retaking the GRE. One of the biggest reasons students aren’t successful on their GRE tests is that they practice in short burst and then restart prep at a later time. Thought this will show moderate gains in scores, you will not be able to reach the upper 320s through short bursts of preparation. What sets a 90 percentile apart from the rest, is that these people make learning a habit. This includes learning vocabulary consistently (at least 30 minutes everyday), practicing question sets every other day and taking full-length mock tests every other week. This also means that you spend time on reviewing practice drills and vocabulary on a regular basis. Follow these 5 steps and you should be on your way to a stellar GRE test day experience! Good luck!